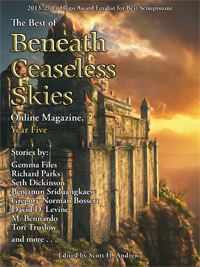 The Best of BCS, Year Five features such authors as Richard Parks, Gemma Files, Seth Dickinson, Alex Dally MacFarlane, and Benjanun Sriduangkaew. It includes “Boat in Shadows, Crossing” by Tori Truslow, a finalist for the 2014 British Science Fiction Association Awards and the Parsec Award, and “The Telling” by Gregory Norman Bossert, winner of the 2013 World Fantasy Award. 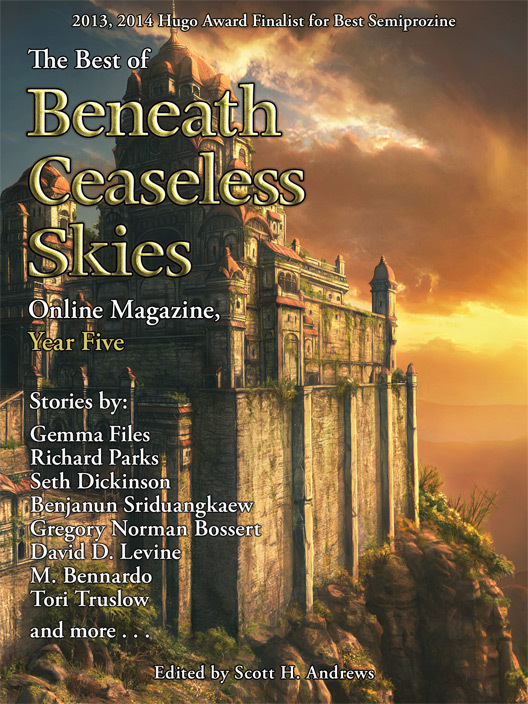 The Best of Beneath Ceaseless Skies Online Magazine, Year Five is available for only $3.99 from major ebook retailers in different ebook formats, including Kindle, Kindle apps, Barnes & Noble, and iPhone/iPod Touch/iPad, and more. Read it on your e-reader, smartphone, laptop, or tablet. All proceeds from the sale of The Best of BCS, Year Five go to pay BCS authors and artists for their work. Buy a copy to read great literary adventure fantasy and support Beneath Ceaseless Skies.